Three years ago today I published my first blog post. On the occasion of my first blog anniversay I made a pistachio cake. Then, when the second anniversary rolled around, I made another one. I commented at the end of last year's post that it was possible that I had started a tradition. And I really had planned to make a pistachio cake this year.... But developing yet another pistachio cake for anniversary number three just didn't happen (I didn't even have the opportunity to take a first stab at it). But not to worry, I was able to carry on with the tradition of a sweet treat featuring pistachios...in the form of a batch of Pistachio Shortbread cookies. The dough for these cookies is a lovely pale green color. Unfortunately after their stint in the oven the color fades. The baked cookies have a subtle green cast...and a few flecks of green color from the larger bits of pistachios...but if you didn't know what they were, you might not guess by looking. Fortunately there is no mistaking the flavor once you have them your mouth. The combination of the meltingly tender texture with the delicious flavor of pistachio is a surprise and a delight...making up for—if not enhanced by—their subtle color. I like these cookies just the way they are...but as I mentioned last year, I love pistachio with orange and chocolate, too. So maybe next time I make them I will add a little bit of orange zest to the dough. This time I half-dipped some of the cookies in dark chocolate. They were delicious. And I noticed that the chocolate seemed to make the pistachio flavor even more pronounced. The basic shortbread recipe from which I developed my pistachio version can be found in Emily Luchetti's Stars Desserts cookbook. I just added some pistachio flour and a little bit of sugar to her recipe. Later I observed that the quantities of the ingredients in my pistachio recipe were almost identical to what they are in my Scottish Shortbread recipe...entirely by coincidence I had simply replaced some of the flour with an equal weight of finely ground pistachios. Luchetti's recipe is for shortbread cutouts, while the Scottish shortbread is too stiff and dry to roll out (the cookies are formed by pressing the dough into a pan or mold). The "hybrid" pistachio dough is quite malleable and rolls out beautifully—even though it has a percentage of dry ingredients that is like the Scottish recipe. I can only assume this is due to the increased amount of fat in the nuts (which make up part of the "dry" ingredients). The pistachio dough also holds its shape well in the oven—scalloped edges are crisp and holes punched from the tines of a fork remain. You could roll and cut these cookies into pretty much any shape that you like. Since the dough was such a gorgeous green, I decided to cut the first sheet of dough into shamrocks for St. Patrick's Day. The resulting shamrock shortbread cookies were very cute (if not very green). And as I was taking pictures of them for this post, it occurred to me that the three lobes of the shamrock made a very nice visual tribute for a third anniversary. Maybe I wasn't really supposed to make a cake after all. Spread the pistachios on a small baking sheet and toast in a 350° oven until fragrant—about 5 minutes. Let cool. Reduce the oven temperature to 300°. Using a rotary nut grater, grind the cooled pistachios to a flour. Using the paddle attachment of a stand mixer, beat the butter, sugar and salt together just until combined and smooth...it is not necessary (or desirable) to cream until light and fluffy. Add the flour and pistachio flour and mix on low speed until the dough comes together. On a lightly floured surface (working with 1/4 to 1/3 of the dough at a time and adding the scraps from each rolling into the next, fresh portion of dough) roll the dough out to a thickness of 1/4-inch and stamp out cookies in whatever shape you desire. Transfer the cookies to parchment lined baking sheets, spacing them evenly (about 1 to 2 inches apart—they can be pretty close together since they don't spread). Chill the stamped cookies until they are firm. If you like, use the tines of a fork to decoratively prick the cookies. You may also sprinkle some granulated sugar over the cookies before baking. Bake the cookies in a 300° oven until set. They should not brown...although they may begin to take on a light golden color at the edges. Let the cookies cool briefly on the sheets before transferring to wire racks to cool completely. Store the cookies air-tight. Depending on the size of your cutters, the recipe will yield about 4 to 5 dozen Pistachio Shortbread Cookies. Happy blog anniversary! I love that you have continued the pistachio tradition. I think the cookies were definitely meant to be. They look delicious. Especially the ones dipped in chocolate. Hi Gloria. Thank you! Happy blog anniversary back to you too! (If I recall correctly, you and I started our blogs right around the same time...I think your third anniversary is right around the corner). Finally made it over here--delicious looking cookies. Course, I'm drawn to the ones dipped in chocolate. ;) SO glad you are blogging! I just bought some pistachios. Hmmm. Love the idea of you always doing something with pistachios on the day, not just cake. Thanks Katrina! Yes, I suppose I could branch out even to something savory...I do love pistachios...but I also love dessert! Hi there, I just discovered your blog today whilst searching for a recipe for the Classic Waldorf Salad of my youth. Found it! Anyway, congrats on your 3rd blog-aversary. In a past life, I worked for a California pistachio industry advisory organization, soooo, I came across lots of pistachio recipes. It's such a pleasure seeing your varied use of (still) my favorite nut. 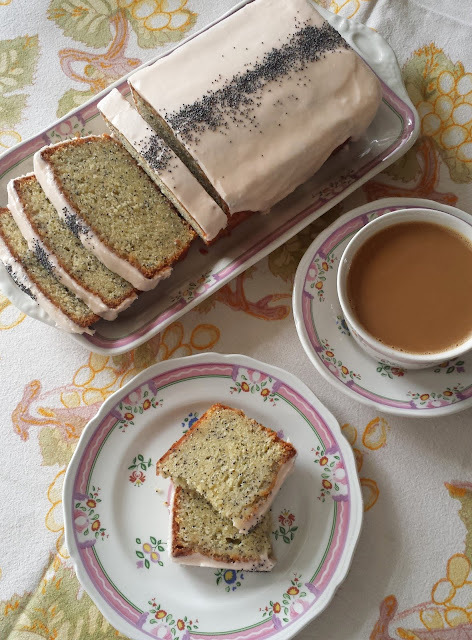 I have a wonderful recipe for pistachio torte using pistachio flour that I found online after being gifted with a 5 lb bag of the stuff from a generous grower. I think the only ingredients are egg whites, yolks, sugar and pistachio flour. So good and it stays greenish! Anyway, congrats again. I'm loving all your recipes! Hi Sara, I'm so glad I could help you with the Waldorf Salad! And your pistachio torte sounds delicious--and without any wheat flour would be great item to serve to friends who can't have gluten. I was so surprised that the green color in these cookies faded (both of the cakes I made held their green color)....but the proportion of pistachio is not quite as great in the cookies. Thanks for taking some time to look around my blog...and for taking the time to leave a comment. I hope you find many recipes to enjoy!